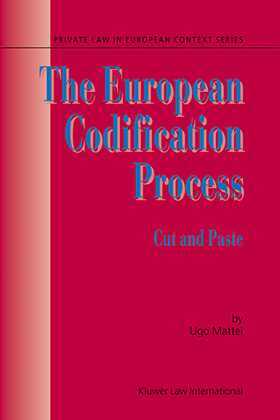 This volume contains thoughts on the issue of Codification of European Private Law and on the present state of European Private Law by one of the protagonists of the debate that is unfolding in Europe. Taking a sometimes sharply critical view, Professor Mattei attempts to unveil what he considers biases, strategies, and ideologies that affect the European legal process. The work attempts to open a basic and genuine political debate between legal scholars, which he considers an unavoidable prerequisite of any major reform process in private law. Challenging the claim of technocratic neutrality shared by much of the most influential European legal academy, the author uses the tools of Comparative Law and Economics to set priorities on the table and to show some of the real stakes of the present process. The work explores fundamental areas of European private law, from the sources' to contracts' to trust law. Context and Acknowledgments.Chapter One. The Comparative Law and Economics Approach to the European Civil Code. An Introduction.. Chapter Two.The Professional Project: Practitioners. Chapter Three. The Professional Project. Scholars. Chapter Four. Postmodern Legal Scholarship and the Codification Process. Chapter Five. Hard Code Now! A Critique and a Plea for Responsibility in the European Debate over Codification. Chapter Six. Contracts, Schizophrenia and Beyond. Chapter Seven. Should Europe Codify Trust? Conclusions. What is Missing?